The Bombay Courier, India. June 23, 1810. “On Tuesday last His Majesty’s Ship, the “Minden” built in the new docks (Bombay) by Jamshedji Bomanji Wadia was floated into the stream at high water, after the usual ceremony of breaking the bottle had been performed by the Honorable Governor Jonathan Duncan. In having produced the “Minden”, Bombay is entitled to the distinguished praise of providing the first and only British ship of the line built out of the limits of the Mother Country; and in the opinion of very competent judges, the “Minden”, for beauty of construction and strength of frame, may stand in competition with any man-o-war that has come out of the most celebrated Dockyards of Great Britain. For the skill of its architects, for the superiority of its timber, and for the excellence of its docks, Bombay may now claim a distinguished place among naval arsenals”. Hugh Farmer writes: All very interesting but in what way is HMS Minden relevant to the Industrial History of Hong Kong? The ship was in active service until 1840. The following year a typhoon destroyed the shore-based Royal Naval Hospital in Hong Kong and Minden was commissioned in December 1841 to serve as a hospital ship here. 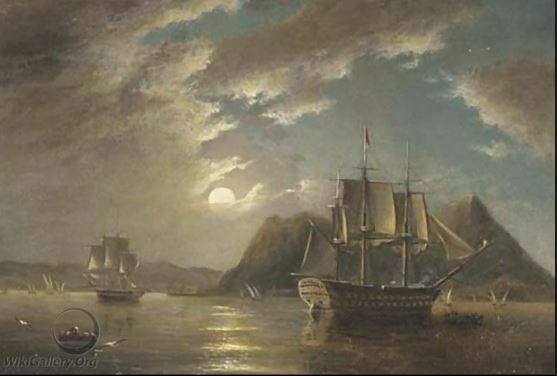 She was stationed in Hong Kong for this purpose until she was replaced by HMS Alligator in 1846. The Minden then served as a stores ship until August 1861. At that point she was then sold for scrap and may well have been the very first vessel to have been ship-broken in Hong Kong. 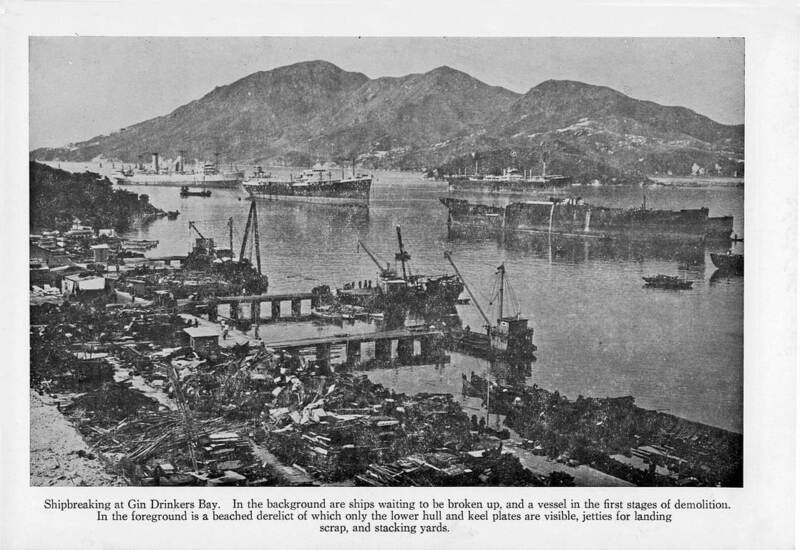 Post WW2 Hong Kong’s ship breaking industry expanded so that by 1960 84 ships were demolished with a gross tonnage of 558,120. The following year year there were 23 companies registered as ship breaking firms – with a total investment of HKD100 million and employing over 4,000 persons. Gin Drinkers Bay really needs another article. This area of Hong Kong has changed almost beyond recognition since the photo was taken. The bay was reclaimed later in the 1960s and became Kwai Fong and part of Kwai Hing. At the mouth of the bay stood the island of Tsing Chau which became a land extension of Kwai Chung. So when you look at the container terminal opposite Tsing Yi you are looking at what was Gin Drinkers Bay. Interestingly, Minden Row and Minden Avenue are both located close to Signal Hill in Tsim Sha Tsui. Were they named after the ship? It seems unlikely as a quick check in Signs of a Colonial Era by A. Yanne & G.Heller, HKUP 2009 states that they were not named until 1923, sixty years after the HMS Minden was broken up! This article was first posted on 26th December 2013. Would a oak brass mounted lock box from h m s minden j.noble hong Kong on plaque be valuable?